Last month Chinese trade statistics left us with several key questions. Export growth was a clear outlier, with outbound trade rising nearly 45% year-over-year in February 2018. There were the usual Golden Week distortions to consider, made more disruptive by the timing of it this year as different from last year. And then we have to consider possible effects of tariffs and restrictions at the start of what is called a trade war (but isn’t really, at least not yet). Given those factors, Chinese exports unsurprisingly declined in March. Falling 2.7%, it was the first negative since last February and the same holiday deformation only then affecting the calendar in the other direction. 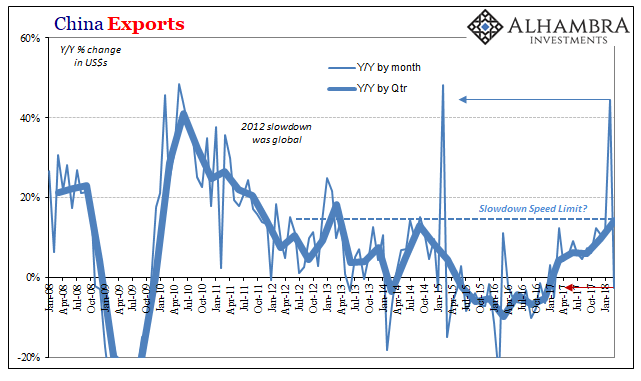 Altogether in Q1, Chinese exports were up only 14.2% despite the otherwise huge gain in the one month. That’s better than 9.9% in Q4 2017, and 6.0% in Q3 2017, but is that acceleration or distortion? We won’t know the answer to that key question until a few months further into 2018. Even if it is acceleration, it’s still within the same post-2012 parameters (slowdown speed limit). And you have to wonder if it takes a 45% month to produce 2014 levels of growth, just how much is global trade really expanding? It wouldn’t be anywhere close to the boom/inflation narrative. That much we can witness on the other side of China’s trade statistics. For all we make out of the export segment, with good reason, it is Chinese imports that are the real driving force in global reflation. 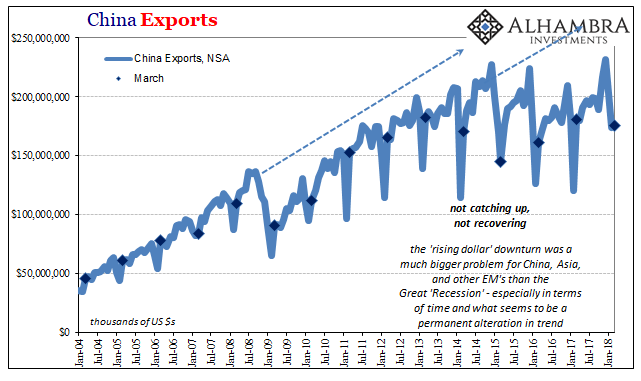 In other words, exports tell us about the global economy while imports tell us about how China is attempting to deal with that global economy as it really is. Considering distortions here, too, after 37% growth in January 2018 China’s imports rose just 6.3% in February and now 14.3% in March. For Q1 as a whole, that’s a year-over-year change of 19.1%. That’s better than the 13% rate achieved in Q4 in absolute terms, but not meaningfully better. 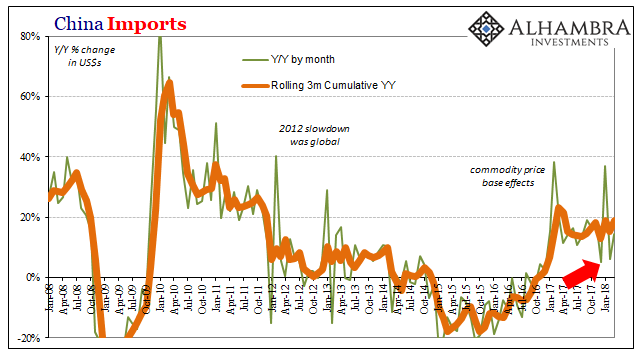 Chinese import growth has stalled. A Declaration Of Trade War On China?